This unique chili based barbecue blend works well as a dry marinade or as a base for sauces. Rub the outside of meat or chicken with oil, then coat with a generous amount of spice blend before baking or grilling. Add that spicy zing to your favorite barbecue sauce. Creates a wonderfully robust and smoky flavor to potato dishes, baked beans, casseroles, and eggs. 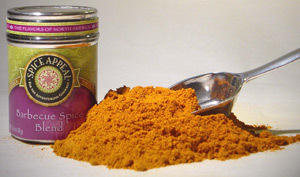 Contains paprika, chili peppers, black pepper, onion, cumin, and a variety of other spices.